The best Comcast modem and Xfinity routers compatible with Blast and Performance cable internet. As well as the newer Comcast Gigabit, future-proofed DOCSIS 3.1 modems. We will also cover the best Xfinity modem router combo. We’ll cut to the chase, 95% of you are going to walk away with this combo modem router seen here. It’s cheap and powerful making it the best replacement combo modem router. Instead of a modem and router, you can buy this single modem router combo device. This will be the best and easiest option for 95% of 1-2 story home users. Note: If you live in a larger 3+ story home, you should buy the modem and router separate to get the stronger WiFi signal. With these stand-alone cable modems, you have several options depending on what speed package you subscribe to. You will still need to obtain a router from the next list. Warning: You must use a voice modem if you have Triple Play, even if you do not use the voice. No matter what stand-alone modem you buy, you can use any of these routers. They are compatible with all speed tiers of Comcast. You must buy based on your house size. Note: Most people only need the 1-2 story router. View the full house size router guide here. What combination router should I get? If you’re here looking for the actual best possible modem for Comcast, the number one choice is a MB8600 DOCSIS 3.1 modem which is the only modem approved for Comcast Gigabit speeds. This high-performance, new technology modem paired with a powerful router or mesh kit cannot be beaten by any combo modem router on the market. It truly is the top performer when it comes to fastest internet speeds. If you don’t plan on getting Gigabit, then the current best DOCSIS 3.0 modem choice would be the CM600. It can handle Comcast Blast and Performance internet up to 400 Mbps. If you are going for the cheapest modem, the Netgear CM500 will work up to 200 Mbps. The truth is the CM500 will be the best choice for almost everyone. Most people never get anything over 200 Mbps. Either modem paired with a WiFi router that matches your home size will be the best combination set up for Comcast subscribers. Isn’t a combo modem router the best option? We recommend two devices over the combo modem with wireless built-in. These are the reasons why. Two devices are better. The stand-alone cable modem and any of the mentioned routers will have better performance than the combo modem router. The higher cost comes from better equipment. 2 separate units makes it easier to replace if something goes bad. This should not be an issue, but life happens. With a combo unit, the whole thing must be replaced. Nerd options. The ASUS GUI gives you a lot more control. It is simple and intuitive for even the non skilled. A great way to start learning networking from home. The real reason, they are better routers. External antennas will get higher speeds at a distance. The combos won’t go beyond 2 stories. 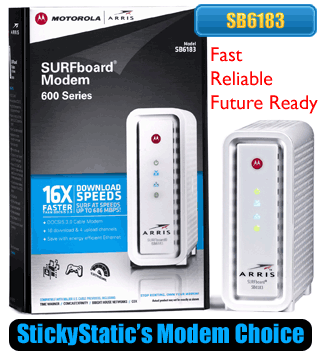 You may have heard that the ARRIS SB6190 is a better modem. It is not. Stay away from the SB6190 or any modem on this bad modem list. We’re not even going to compare the two devices because when it comes down to Puma 6 vs Broadcom, there is no comparison. Modem Compatibility Issues: The MB8600, Netgear CM600, and CM500 are all compatible with Time Warner, Charter Spectrum, Cox Communications Ultimate, Brighthouse Networks, and of course Comcast Xfinity. Do not buy a used modem! Do not buy a used modem. Used modems have already been added to another Comcast users account and many times in another state. The account is usually closed, and the equipment MAC address is still on there. You will not have permission to remove the device so that you can add it to your account. The agent will require you to visit a Comcast Cable Store and bring the physical modem for them to verify and add to your account. You’ve been warned, do not buy used. End Of Life Modems – ARRIS SB6141? Netgear CM400? Older 8×4 modems with only eight down channels such as the SB6141 or CM400, are starting to be removed from the internal supported devices list. According to several of our readers’ statements, those modems are no longer on the approved list for Xfinity cable internet when they called and tried to have them activated. As for the (16×4) DOCSIS 3.0 modems, even if they do get added to an end of life list in 8 years, they would continue to work if the mac address is already on your internet account. Sace $120 a year, forever. Save $10 a month on Comcast internet bill. 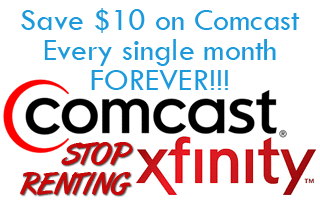 If you stop renting your modem from Comcast, you will save $10 a month. They are charging you to rent their old modem. This means in just one year, you will have saved $120. It adds up. I have used Comcast for over 18 years, meaning I have saved $2,160 dollars on my cable internet bill. Sure it may seem like a lot to pay for replacement equipment now, but I promise you it will pay for itself in the long run. Improve your Comcast internet download speeds. In most cases, people experience improved speeds when they buy a replacement retail modem and router. Reason being, these are the latest DOCSIS 3.0 modems, they have higher bonded channels than most Comcast provided modems, and the routers have higher rated wireless signals. They are newer technology and run cooler than the rental modems that often overheat and reboot or cause random disconnects from other malfunctions. So overall, you can expect more reliability and an improvement in your Xfinity cable internet service. How do I install my cable modem? You don’t have to do anything. This cable modem is a plug and play device, meaning all you do is plug it in and it works. All you have to do is call Comcast, give them the MAC Address so they can add it to your Xfinity internet account. They know this call very well and will not be giving you trouble. They will do it, and you’re finished. The mac address is on the bottom of the modem on a sticker, and it is clearly labeled. Check Out These Fastest Modem Speeds. You can verify your cable internet modem speeds via the online speed test. Here are the download speed results from my self-bought replacement modem. Even though I am only supposed to get 100Mbps, I always get around 120Mbps with this cable modem. When I was forced to rent from Comcast, I would often be stuck around 30Mbps even though I was paying for better speeds. Your results will vary based on your cable ISP, speed package, and location. Notice how it says faster than 90% of the US? This is because most people rent a modem and router. Good luck, please feel free to ask questions below! DOCSIS 3.1 Gigabit, Comcast Blast and Performance. 32 download channels. Xfinity Blast and Performance. 16 download channels. Blast and Xfinity Performance. A phone modem is required with any voice package. 24 download channels. Extreme, Blast and Comcast Performance. 16 download channels. Comcast Blast and Performance. I am starting with Comcast with their Gigabit package triple play. I am looking to use a router and modem and have someone install a switch to allow me to get all my tvs ethernet ports, as well as, each of my google wifi points hard wired in for best possible performance. What is the best router I can buy that will help in the application. I am probably going to get approximately 14 total ethernet ports. Also I am having my cameras run into the router as well. I think they were being mean. There are no retail DOCSIS 3.1 modems with telephony/EMTA capabilities. You’ll be stuck with their rental equipment if you need a phone service and Gigabit. Of course you can get that rental unit, bridge it and use your own router but you’re still paying the monthly fees. Hi, we will soon be cutting the cord for everything but internet through Xfinity. We are going to get the 150mbps speed. With two computers, two tablets, three cell phones, two game systems…..and will be getting a roku. What modem and router do you recommend for a 2100 sq ft 2-story house? The one that best matches your Comcast 150Mbps tier, would be the first combo modem router. Hi there, thanks so much for the information. We’ve been troubleshooting wifi issues with Comcast for a while. We do rent the modem/router combo (have Triple Play and pay for the fastest internet speed). Not a gigantic house but many people in it with lots of wifi needs. After reading your articles, we decided to go the separate router modem setup. We started with the router and bought the Orbi Mesh system and hooked it up to our existing Comcast modem/router combo and got it working. Huge…I mean huge difference right away. So easy to set up. We now tap into the Mesh wifi setup and it’s so fast! Now we want to stop renting the modem from Comcast and buy our own. In the Orbi app, I’m getting download speeds around 300+Mbps when I test it. I don’t need the combo modem/router anymore because of the Orbi Mesh system, but should I buy the CM500V or the C7100 AC1900? I’m wondering about speeds? Since we have the Orbi, I don’t want to lose speed if we don’t have to. Also, regarding the Orbi, we put a satellite near the Xbox to boost the performance. Is there a benefit to hard wiring an ethernet cable between the Xbox and the Orbi satellite? Thank you, thank you, thank you! The Orbi Mesh is fantastic!! Thanks for all the information. The Orbi is a great option. But if you have a Comcast package over 200Mbps, you’ll need to get the C7100. You can disable its built in router and use your Orbi. It will be the better option for full coverage. As for the XBOX, I myself would hardwire if I could. It takes one more hop out of the latency because no matter what, wires are always going to be better than wireless. I am currently being notified by Comcast that my modem and router are not capable of delivering the speeds that they are providing. Soon, I am planning to switch from current Xfinity blast internet ( up to 250mbps) to Verizon Fioz 100mbps/100mbps, for a two-story 1800sqft house, what modem and router would you suggest? I do not think a Comcast modem will be compatible with Verizon Fioz. As for router, check our the chart. The wireless will work with any modem on any ISP. I currently have direct tv and fios modem but I am moving and keeping direct tv but now getting xfinity for internet only. The plan is for 60 mbps. Only two of us in the house mostly, both have smart phones,iPad. As for the TVs two smart tv but one has 4K. We use the fire stick only once in a while. Which modem is best for docsis 3.0? Also we only have a modem now with fios and xfinity also said only a modem is needed. They said nothing about requiring a router as well. It’s a trap! You definitely need a router if you want a wireless network in your house. Those reps are often clueless as to what you’re asking so they just tell you whatever sounds easiest. If your internet is only going to be 60mbps and you have a standard size living situation, any of the lowest options are more than fine for you. The lowest modem plus router or the lowest modem router in one combo. What is the best internet modem to buy for a Belkin router? The answer for a Belkin specific router would be any cable internet modem. There is no special compatibility need for any exact router, specific model, or brand. You should always buy your modem based on your cable internet needs, and then buy any wifi router based on your house size or other requirements. Great info. I am looking to get a gateway/combo and live in a small 900 sq ft condo so I think I will be fine. You seem to recommend Netgear. But everyone is telling not to get Netgear as they tend to break and the warranty is horrible. Even though there is a year warranty if you break it after 3 months, they require you to send it in to be diagnosed and it will cost you once $100 to do that. Thoughts? Have you seen this issue? I have not seen people reporting issues of Netgears breaking. They are a long-standing router company. I use ASUS mostly now but have had many Netgear routers over the years. We are dropping Directv and switching to Comcast Triple Play. A whole new set of issues now…the modem. We do not want to rent theirs. Modem, voice, Router. Do I have to get them all in one, can I get just the modem and voice and get the router separate? I am reading Netgear is the best…We are not gamers.. we will have download speeds up to 250 Mbps. See the entire page dedicated to voice modems. It explains everything in detail. You will make your choice or ask any further questions there. I just recently upgraded to Comcast’s Gigabit service. I noticed you have the Motorola MB8600 listed for that service but was curious how you compared it to the Arris SB8200 and Netgear CM1000? As far as a stand alone router to pair with it, I’m debating between the Motorola MR1900 and the Asus RT-AC68U. Emphasis more on wired gaming than anything, and I know the Asus is a bit dated but it seems to have stellar reviews even for people on gigabit services. Thank you for the blog and any help. Funny you ask. Here’s the two modems going head to head in our comparison. MB8600 vs Sb8200. There are some interesting differences. And yes, the ASUS AC1900 is still an excellent router, and if hardwired for gaming, you won’t have a worry in the world with other task like streaming on your TV. I had that router for a long time. Thank you for the reply. I ended up going with the MB8600 and the Asus AC1900 and am thoroughly satisfied with the hardwired performance and even the wifi for less-important devices around the house. I actually had the MR-1900 router AND the Asus at the same time to setup/test then return the “worse” performing of the two. I can only assume something in the settings I was missing for the MR-1900 as I was never able to get over 400mb on my Comcast gigabit line, even trying some recommended tweaks after searching online. Rather than torture myself I just hooked up the Asus AC1900, basic settings/wifi setup and right out of the gate 950mb down like clockwork. And the UI for the Asus (in my opinion) is VASTLY superior. It’s insane to me that it is 5+ years old. Again I’m sure it could have been user error on the MR-1900, but it’s very basic UI/options and trouble starting up out of the box earned it a 1-way trip back to the store. Thank you again for the very interesting reads/recommendations! Ended up going with the MB8600 and actually purchased the MR-1900 router AND the Asus AC-1900 to compare and return the “loser”. I tried the MR-1900 first, opting to try and stay with Motorola on the modem and router choices. It’s UI/options left a lot to be desired and after multiple shots at tweaking/researching, I could never get it to hold over 400mb/s down, even though hooking straight to the MB8600 modem I was consistently getting 900-930mb/s on my Comcast gigabit line. Instead of torturing myself, I opted to just hook up the Asus AC-1900 to check it out. Basic plug-n-play settings and setting up the wifi, it instantly was popping at 930-950mb/s, even consistently higher across the board than when straight-lined to the modem. Not sure if that’s just dumb luck or it actually handling the traffic better than Modem-to-PC. The UI/options are insane, and the performance as well (including wi-fi range/strength) for a device 5+ years old. EXTREMELY pleased with your recommendation and while I’m sure the MR-1900 could have been something on my end that I wasn’t aware to alter, it earned a 1-way trip back to the store. Thank you again for the information and guides! Excellent! Thanks for the follow up. You made the right choice and thanks for testing out the MR-1900 for us. ASUS has been consistently solid when it comes to wireless and no matter how long I own a router yet I have still upgraded just to test new ones out. There are 6 people in our family. Lots of online gaming and streaming on Netflix, Hulu, & such. Our home is 2 stories & roughly 1500 ft2. We have Comcast Xfinity for internet & have the Gigabit download speeds package. I want to purchase a modem & a router. I want good quality, but don’t want to break the bank. I’ve been researching & reading up on multiple options, but really don’t know what is best for us. Can you help? You are forced to get a DOCSIS 3.1 modem with Gigabit speeds and router wise, you would need a higher end Wireless AC 3100 or above. So you will be breaking the bank, but it’s the price of high usage streaming and gaming for a 6 person household. The good thing is you won’t be renting from Comcast anymore and you will have reliable service for all users. Trying to cut the cord, but need the web of course. My home is 2800sqft approx, and two stories. The problem is my access point is in the far corner of the home from the TV in my room and my son’s room. We just use streaming, and he needs to update the game console from time to time. However we don’t online game as he’s too young for that. I also use a wireless network for my home office with light use. Just shoot me straight up what I should get. I’m coachable and can set anything up with directions. I just don’t quite know the ins and outs on the strength of signal side. I’ve tried repeaters and have found they have limited effects due to the primary access point into the home being sort of offset from the main structure. Thanks so much. Great read. I also love the idea that they aren’t going to weaken my signal by piggybacking my home network as a hotspot. Since it sounds like you already tried the repeater access point plan(not ideal), you may be forced to go with Wireless Mesh as mentioned in the router suggestions. Check it out, there is a whole article there. Yes it cost more, but it works. I had to help my mom with this for her home security system. Repeaters do not cut it. To lower our monthly expenses, we just dropped my phone service and decided to buy our own modem and router. Home is about 1700 square feet, and we decided on 100 mbps service. We don’t often run multiple devices, and we aren’t gamers. Do you have a suggestion for modem and router combination? Any drawbacks to purchasing on the internet, or would it be better to go to a local retailer like Best Buy in case something doesn’t work right? With the 100Mbps you can use the CM500 and depending on router location and floor plan, the AC1750 would likely work. Of course centrally located will be better than far off on one side of the house. I currently use Comcast (or they use me!) and have their 150 mbs internet connection with TV and phone. Before adding the phone I was using an Arris SB6183 Surf Board cable modem and a TP-Link AC1750 wired router with Wi-Fi. When I added the phone function Comcast installed an addition modem for the phone connection which also has dual freq. Wi-Fi and Xfinity Hot Spot (Which I have disabled, I think). Of course, they are charging me a monthly rental fee for this unit. I also have a second TV with one of their very old boxes for which I’m paying $5.99/ month “extra TV fee”. I’d really like to get rid of these monthly fees, or at very least, the phone modem fee. I’ve tried to find the best and least expensive item(s) to purchase for this, without much success. Could you possibly suggest a good configuration? The very unfortunate thing with the phone modem is that you can no longer use a regular cable modem. But you can sell it to recover losses. Just make sure you have Comcast “remove it from your account” first so whoever buys it does not have a problem. But the good news is that you already have your own wifi router so you only have to buy a stand alone voice modem. It is all explained on the voice modem link above but the CM500v is the stand alone option. Thank you so much for the insightful information! I have been subscribed to Comcast Xfinity for a long time now, and have recently upgraded to the Gigabyte internet tier. I have been renting the default gateway, and am ready to move onto my own, but am limited due to the Xfinity voice requirements. What would be the best gateway options that accommodate the voice input and supports 1gb down? I must ask, what gateway do they rent to you? There currently are no DOCSIS 3.1 voice gateways available on the market for gigabit speeds. Only non DOCSIS 3.0 voice modems that Comcast has not approved for 1GB. I really enjoyed reading your article and I am understanding better about the modem and router. I currently subscribe to Xfinity Triple play with the Blast package. I need to upgrade my equipment. My current modem is ancient SB6120, I believe and my router is Linksys Wireless 2.4 GHz. I also have a voice modem in the basement from Comcast. I own my router and internet modem. I would like to know what would be the best modem and router for me to upgrade to? Can I also buy the voice modem to replace the one from Comcast? I would like to purchase something that would not have to be replaced in a few years. I lived in a split level home not very big. Yes, the Netgear combo voice modem would replace the one they supply and not need replacing anytime soon. It is dual band 2.4Ghz and 5Ghz. Great article! We do have xFinity Triple Play (voice) with Extreme. You mention those are forced to use an EMTA modem, but possibly didn’t provide options? We’re sick of Comcast’s ultra unreliable gateway and poor speeds. Xbox (hardwired) 4KHD spoiled and WiFi gamers at heart. Urban mid-large house. Looking for a compatible AI1 or dual devices. Pre-thanks! Reread and found the link for C7100V 24×8 DOCSIS 3.0 Cable Modem Router (w/ Voice) link. If this is the only option, so be it. Thank you again. Have upgraded Comcast modem today. Now realize have to upgrade old Linksys router. Suggestions for WIRED router compatible with Comcast and can handle 250+ speeds? Thanks. Wired with no wireless at all? I mean you can get anything really. Whatever brand interface you prefer. You will surely save a lot of money that way. What is the best modem/router combo to use with Comcast for streaming with fire stick? The best one is listed above. Nighthawk DOCSIS 3.1 combo modem router. However the cheaper DOCSIS 3.0 Nighthawk listed will work fine for a Fire Stick or Chromecast. I own my own modem and router and subscribe to Xfinity Blast. My current modem is a NetgearCMD31T and my router is a Netgear Nighthawk AC1900. Do I need to upgrade my router in order to maximize my speeds and power or do I just need to upgrade my modem. I was thinking of the Netgear CM1000 but after reading your article I ‘m thinking the SB6190 or even the Motorola. I am not a gamer but want a powerful network to reach outside of my home. We do use streaming video. I’d like to stay ahead of the curve would appreciate your advice. Thanks. The CM1000 is a DOCSIS 3.1 modem so it is better for staying ahead of the curve because it is on top. The SB6190 is only DOCSIS 3.0. Sticking with Motorola though, the step up from the SB6190 is the SB8600. It is a DOCSIS 3.1 modem ready for next gen speeds. It is also usually a few dollars cheaper. These will not change your wireless signal though. The Nighthawk AC1900 is a good lower end AC router and will do for most people but when it comes to reaching outside you often need a more powerful router like the AC3200 or higher or in many cases a wireless mesh system like the Orbi. My house is about 1500 square feet. I’m looking to purchase a router and modem so I can stop paying rent. I’m the only one living here but occasionally I have people over. I do have a fire stick that I do use. I’m assuming I need both router and modem. What would you recommend? I live in a rural area and have good internet speed, but not great. I am looking for a good modem and router for my needs. I am not a gamer but only a net surfer, we do have the Comcast HD Package and a 4K TV if that makes any difference? I would like to find good devices that are reasonably priced, any options would be appreciated. It is going to depend on where your router is in relation to your 4k TV and how big your house is. I personally hardwire my TV and XBOX because even the highest strength router can have problems in my busy apartment complex situation. But if you are in a rural area without interference, the cheap Netgear budget modem and the ASUS AC2400 above or even the AC1900(especially if you can hardwire the 4k devices) will do just perfect for browsing all over the house. I recently installed a Netgear Nighthawk combo and everything worked fine with the exception of the X1 wireless boxes that Comcast conveniently did not tell me when I called to find out if it was compatible. Is there a combo that can accommodate the X1 wireless box? To my understanding, the Comcast Xfinity X1 Boxes do not use the wireless at all. They obtain their signal from the coax cable just like the cable modem does. If this is true, I’m not sure what is going on here. Hi, thank you for the wonderful information! I have a Netgear N300 combo modem router, and I have xfinity’s performance pro speeds. When wired up, I get over 100Mbsp, but wireless I only get anywhere between 0-30. To get better speeds wirelessly while still using the Netgear N300, can I pair it up with the ASUS AC2400? or would I need to also get the faster modem to get higher speeds wirelessly? Ideally, I would like to keep the Netgear N300 combo, use it as a modem only, and add a better router, but I don’t even know if it’s possible to pair up a router with a combo modem/router. Thank you for your help. Yes, you can indeed do that and some have. You would put the old wireless N router in “bridge mode”, bypassing its router function and passing the direct signal on to the new AC router. But you will still be paying $10 a month to Comcast in rental fees for the old router. A nice replacement modem will remove that fee and pay for itself in less than a year. I got the new ASUS AC2400, and that worked perfectly with my Netgear in bridge mode. I ended up replacing my Netgear with the SB6183 and I’m now getting 120+Mbsp everywhere in my apartment. The DOCSIS 3.1 modems are the latest modems out and are what Comcast/XFinity recommends for their 1 gig service. So if I was going to buy a new modem, it sure would be DOCSIS 3.1 and have it backward compatible to the speeds I use now. For example, Comcast has the Blast service at 200 mbps download, which I had. I just upgraded to Extreme Pro at 400mbps (additional $20/mo) and they have the 1 gig service at 1 gig download speeds in certain areas. They recommend Arris SB 8200. Yes, it’s more expensive, but for those that want speed and compatibility into future, this is it. I am on Verizon right now but that may change. Whether I change or not, I still want to avoid renting a wireless router. Are there routers that will work on both Comcast and Verizon and if so could you recommend some? Yeah, every single stand alone router listed will work for any internet provider. Not just cable internet, but also any DSL provider. I have used my ASUS routers with AT&T DSL, Century Link DSL, Comcast cable and Cox cable. Hi. I’ve had AT&T for my phone and internet service for the last 17 years and Directv for same amount of time. Never bundled. Where I live you’re given (2) options: AT&T or Xfinity for internet service. I’ve had it with the slowness of our internet and all my friends recommend to convert to Xfinity. I have an extremely busy and crowded household comprised of 7 Directv wireless genies, a landline phone that’s never used, multiple laptops, multiple cell phones, Amazon firestick, and video gaming. Can the Xfinity provide the internet service to run the Directv boxes and everything else? Home is approx 2700 sq ft., 3 floors. What would you suggest as the best modem and router for my situation? And, what would be best location? The main receiver for our Directv is on the main floor. The Xbox is in my son’s room upstairs. If it’s really a plug-n-play unit, do I run it wired to the Xbox and everything else is via wireless connection? I am not “internet savvy” at all. After looking into the DirecTV Genie, it appears to just be like any other wireless streaming device as far as bandwidth usage goes. They say it uses about 10mbps. I assume you would not be streaming on all 7 Genie’s at the same time but yes, Comcast would be able to handle it all on a 100MB Performance Pro plan. If you do not use them all at the same time, the 50MB Blast plan may work. Last time I had AT&T they had no speed tiers even near that but Uverse could have evolved. In a 3 floor situation, you always want to try and get in the middle because one router will have better reach. And me personally, I have my XBOX hardwired from the router, a long cat5 cable running to it. Wireless will always have hiccups at some point. As a gamer, that is something I do not want. They are not noticeable when streaming or using your phone /computer to surf the web because buffering counter acts that. But that does not work with gaming, 1 second of lag and you are dead. You could also just not tell your son this and he would never know. It’s not frequent and it is not noticeable to most. When it comes to one router interacting with several devices at the same time, you want a good processor, enough memory, high bandwidth, dual band and 4×4 MIMU. All featured of the AC3100 router. You’ll be bale to put users on separate wireless SSID’s to even out the load. You say that we can save $120 a year and that will pay for itself in less than a year, but we need to buy the modem and the router! So that doesn’t make sense to me! It seems to me that this is going to cost us about a minimum of $370. So over three years to pay for itself! I suppose we are paying for better quality? And is it really worth it? Isn’t there a good chance the technology changes/improves in the next three years and the equipment will be obsolete? Many people already have a router so yes, it would take longer to pay for itself if you do not own an existing router. The wireless AC standard will not become obsolete anytime in the foreseeable future with today’s technology and high capacity streaming formats available such as 4k or even 8k(not like anyone can watch that). Having your own replacement router also ensures that if you were to ever move to an area that did not have regular cable internet, you would still be able to use your own replacement wireless device. This could happen if you moved to somewhere that only offers DSL internet. As for the modem, 32 download channels is going to be more than enough for the countries current infrastructure which won’t be replaced any time soon. I’ve been renting the Comcast xfinity dual band wifi802.11ac xb3 combo router/modem. Not sure what it is but it cost $10.00 a month. Model number DPC3941T. I have tv and 100mp speed internet from them and I live in a 2600ft 3 story townhouse. We stream Apple TV and have five other devices we use. The router is on the middle floor. I have noticed that the old Comcast router is buffering a lot lately. I wanted to buy my own replacement but not sure on what model to get. Could you please tell me the new router so my life gets simpler. Thanks. That is an older telephony(Comcast voice) modem. Do you subscribe to voice to save money? If so, you must(even if you do not use the line) get a replacement voice modem(above) and both will work for your situation as this is an old old wireless N and the replacements are both newer stronger wireless AC gateway modems. Hi, thanks for the great info. I just ordered Samsung’s Smart Things 2600 wi-fi hub. They also have a wireless mesh wi-fi kit with three units I’d like to install on our roughly 3,000 square foot home. In your experience, should these all get along and play nicely? I use Comcast for internet only, have Dish for tv, no landline. We use the hell out of wi-fi. Also I just ordered a PoE MoCA filter as we have none since I self-installed this past week (moving from one house to another). As I’ve read elsewhere, the Comcast line coming in won’t work with my current combo modem/router (from Comcast) when run through the splitter in the basement. Does that make sense to you? Is that due to signal degradation? I am planning on putting the PoE MoCA filter directly between the incoming cable line from Comcast and the wire to the cable outlet in my office where the current cable modem/router will live until I buy the mesh unit. Thanks for any help you can provide! The modems are the same as far as bandwidth 32×8. The older Comcast issued standard modems usually do not work with MoCA but to my understanding it does. I have never set up a system with MoCA but I read up on it and people say it works with the filter. So I do think it will work just fine. I’m getting just internet from Comcast and streaming using my Amazon fire tv on 2 tv s. I was going to get the cable modem for Comcast. Do I also need a router? Thank you. Yes, that cable modem itself does not have a built in router. You would get a separate wireless router. Or in your situation, you could just get the Netgear combo modem router listed. Hi, very interesting article, but now I’m puzzled. I’m back with comcast after a long love/hate relationship, but of course want to avoid the monthly modem or router fee. I don’t have voice, only internet and tv. I live in a 3 bedroom 1400 sq/ft apartment. What do I have to buy? Recommendations please? If your modem is centrally located you could just get the combo modem that has been approved for Comcast cable internet. Looking for your recommendation… I live in a one story 1,275 square foot house. I would prefer a modem/router in one unit. I have Comcast Xfinity internet with up to 100mbps speed, and broadband TV. No phone. Can you please recommend what modem.router would serve me best? Yes, just click the option titled combo modem router list. In this case you are forced to get the voice modem. It is a combo modem router in one and the difference are listed above. I am not modem wifi savvy, but I don’t want to pay a rental fee for my modem/wifi. I just signed up with Comcast and they are telling me that I need a DOCSIS 3.0 wifi capable modem. Comcast Xfinity gave me a list of compatible modems and combo modems. After researching, I want to go with two separate components. We do not do gaming, just internet, wifi, Hulu & Netfix. We have 2 PCS and 2 phones. What do you recommend I purchase. I have a 12,000 SQ Ft home. I’m looking for a good buy but good quality as well. With that large of a house, you really only have one option. Check out the Wireless Mesh link above. You must use the voice modem as it is the only one compatible with Comcast voice. The Netgear combo voice modem router is the better option. We have triple play service (75mbps) from Xfinity, but don’t use the phone service at all. My brother, and I are big on gaming. We live in a single family home, with 2 bedrooms. He uses wifi to connect, and I’m hard wired. To upgrade, would we need to get a voice combo? Or can we get separate items? Also, which items would you recommend? Great info here. I have a single story home, about 1300 sq ft, where our family of 4 streams everything. I am buying the cable modem, but I am not sure about if the Xfinity router is going to give us good enough range. Any thoughts? Yes, for a one story house this should be plenty of range. I read through most of the comments above and believe we would need the cable modem and the AC3200 router or quite possibly the AC5300 but wanted to run my issue by you before we purchased. We are getting rid of Comcast TV and phone and only keeping the Comcast Blast (200mbps). We are moving to DirecTV and AT&T landline. We have a 1 story 4,100sq ft home (long more than wide) that currently uses the gateway from Comcast and then we had purchased an extender to place away from the gateway towards the bedrooms so we could get service back there. We plan to give back the Comcast equipment and then buy the modem and router you suggested. I assume the modem would go into the room where the current gateway box is connected to cable line. Where does/should the router go? Would I still need the extender? What is the difference between the router and extender. Thanks so much! Correct, the modem and the router will sit next to each other and should cover the entire floor plan. From ASUS’s specs they claim up to 5,000 square feet. Because it should cover the whole house, you will not need the extender in another room. Situations do vary though so you could end up having to get an extender but not likely. I just purchased a cable modem to use for Comcast, I have triple play, I do not even have a phone in my house, Comcast could not add a modem to my account because i have voice on my account, they said i would have to change my plan to just tv/internet which would cost an extra 50.00.or get an emta. Which is better? The Netgear Nighthawk or Asus AC3100? They are the same price. Time Warner is offering free modem, the SB6183. As mentioned, ASUS over Netgear. And Time Warner Cable may give you the cable modem for free, but will charge you a monthly rental price. Look at your bill. The replacement modem is a better idea. Hello, thank you so much for all this information! I understand you strongly advise against buying a used modem, but do you see a problem in buying a new modem and a used router? I found the ASUS RT-AC3200 used, and I would combine it with a new cable modem for a two story house. Thank you! Actually, no I would say this is fine. I myself have sold several used routers on eBay and Craigslist just because I like getting the new things and testing them. The modem issue is only because the MAC Addresses are registered to accounts but routers do not have this issue. I have learned so much from this post!! Thank you very much. I am in the process of buying a modem… and maybe a router (and am soon to be a new Xfinity customer). I have an old Netgear N150 wireless router. Can I use this with a new modem and avoid purchasing a new router? Will this slow down our speed so much that it I would simply be frustrated? Any help would be appreciated… I live on a budget but I also do a lot of research on line so that is why I am asking. If you already have an old N router, give it a shot. It will surely work but speeds and range may be drastically reduced. But in some cases that is OK, like a small studio or 1 bedroom where you are not using the full potential of your downstream and really just browse online and what not. After talking to Comcast technical support I was planning on getting the combo NETGEAR combo modem but now think its better to follow your recommendation. The cable modem will go nicely with the ASUS AC-3100 router I purchased today. I have a large home and a barn that is about 300′ from my house. I have Xfinity triple play with my own cable wireless router (that barely reaches the far end of the house, let alone across the yard to the barn)- Linksys E2000 and Comcast’s modem Arris WBM760. I refused to take the triple play modem they insisted I needed when I signed up for triple play. I want to put security cameras in my barn and stream it to the internet I have in the house. Speeds work fine for what I use it for, mostly internet searches and I do stream some video shows to my iPad. I want to get rid of the Comcast Modem, and hopefully replace what I have with hardware that will allow me to access and capture video surveillance cameras from the barn. I’m NOT techie at all, but I follow instructions well. Can you suggest hardware that will give me the distance I need? Thanks. The wireless mesh routers would be your best option. You can put one in the home and one in the backyard and they should pass full speeds from one router to the other. Hi SS – This is such an informative thread, thank you! I have phone and internet service using an infinity modem-router , it was replaced last year when it died and I now have an Arris TG 1682G dual band, 802.11ac (provided by comcast) that provides both 5G and “regular” wifi. The 5G is not very available throughout the house. House is ~2700 sq ft and 3 floors including basement and I have a very hard time getting wireless connection on the south end of the second floor (modem is on north end of 3rd floor). I would have bought my own modem and router by now but I have PHONE service and there are limited options! I don’t have any TV service. We use this for 2 iPhones, an iPad, one Mac and one windows PC, Sonos music system, and to stream movies using a ROKU player (which is currently hardwire connected in basement) and the occasion visitor. Given the phone conundrum, what do you recommend??? Arris and Netgear have released newer better stronger combo voice modems for Comcast. The list are above. Terrific article. I am getting ready to switch over to comcast blast 75 and I am looking to purchase my own modem/router. My home is single level 1500 square feet with basement. Only thing in use in the basement is a smart tv. Other than that we have 1 laptop, 3 phones and 2 tablets and a firestick. I am currently looking at Arris SBG6900AC/AC1900 router. Is this a good option? All in one combo unit would be located center of the main level. I am open to doing 2 separate devices if its cheaper and works. I will have internet only through comcast. Thanks! Yes, it will work but I myself would go with the Netgear if I was doing a modem combo router. Apple weirdo’s. hahahaha love it. Hi, I understand it’s better to get modem/router separate but if I have xfinity 150mb and want the combination modem/router with the best performance, which modem/router should I get? The one we recommended above. Nice article, really appreciate the info. I am going to assume for my situation that the AC2400 is my best choice, but to clarify, I am on disability and live in a one bedroom apartment. I use wireless due to where jacks are installed. $200 is a lot for me, but I do have some money saved up, and I hate the idea that over time I will be losing out on money, though the 10 dollars a month is more budget friendly for me short term if that makes sense. I just have Comcast 25mbps service since now that my first year deal is over I cannot afford anything faster. Are there any cheaper alternatives that are even remotely worthwhile, or is it just best to pony up the 200 for something that’s gonna last me a decent amount of time and be fairly reliable? Thank you so much. In that situation, the cheapest option we listed would be the combo modem router. It will work for a one bedroom and your speed package. In that situation it is up to the buyer. Both will perform the same with current speed limitations, but the SB6190 is ready for gigabit connections. I am looking for a new modem and a new wireless router or a new modem/router combo. I have Time Warner internet(no cable TV or phone) and their modem along with my router have been horrible. Wifi connection would suddenly evaporate, particularly in the evening when I am working on my laptop. Or the speed would be abysmal. I believe their model numbers are the Arris DG1670A/TW and NetGear WNDT3700v3, respectively. I have read that you favor ASUS brand. I live in a 2 story house with many walls. There are about a half dozen devices connected for casual internet use and a TV for streaming Hulu, Netflix, Amazon etc. We are not gamers at all. I’d like to increase the WiFi range and speed a bit however reliability takes priority. I have contacted Time Warner several times in the past few months which is when they upgraded our modem to Arris DG1670A/TW. Where I live there are no other internet provider options. I would appreciate any help. Thank you in advance. For a 2 story house, the AC2400 should work. But because each situation is different, if it does not, you will have to return it and get the AC3100. If I use the Arris TG862G with an Apple Time Capsule, do I have to call Comcast to bridge the modem in order to use the time capsule? We have Triple Play and use the voice. Yes, it is compatible and you would want to bridge the Comcast gateway. There are steps online and even on Youtube if I recall but calling may be easier. It involves accessing this modems interface and selecting bridge mode. Wanted your input about these two routers Nighthawk X6 AC3100 Tri-Band and the d-link AC3200 Ultra triband, read a lot of mixed reviews. I’m leaning towards the Nighthawk thou my only concern I have is does it overheat and does it require a fan? Over the last few decades I have owned Linksys, Cisco, Netgear, Dlink and ASUS. I personally am sticking to ASUS. They really care and have tackled and nailed it in many consumer electronic markets over the last 5+ years and so far none of their products have failed me, let me down or had a user interface that I did not like. But I would go with Netgear over D-link if I had to. As for overheating, a lot of devices run hot and you are just supposed to keep them in an open air environment like any other computer peripheral and they should be fine. My ASUS does not run hot though. I need to replace my Comcast service modem. Looking for DOCSIS 3.0, 24×8 channel bonding, dual band, 802.11ac, telephony modem/router. What modem/router do you suggest? If this combination is not available, can you please suggest the best option. Both the Netgear and Arris listed under voice modems meet these requirements. Just a note following up on my upgrades — I couldn’t locate to buy either the Arris Tm722 or TM862 for purchase, so I took a chance on the surfboard SB6190, in spite of the fact that I have triple play service(that is, TV, internet, AND voice thru Comcast). Activation was a breeze and the surfboard is running like a charm. I’ve lost the voice service(but we had never even hooked up a phone anyway! ), but my speeds are hugely improved — clocking at 150mbps beside my router, and 60-100 down the line at either extender. Thanks for the suggestion on the modem! This is a positive vote for all of those with a Voice Triple Play and using a non telephony modem. Which Comcast has told me and others directly that it is not possible. I wish they would make up their mind. But the fact that you got them to do it means it is a doable thing and may require hanging up on anyone who says no and calling back until you get someone who knows what they’re doing. However take this route at your own risk because this is the only case I have ever seen of it working. I’m considering both options of separate router and modem, or the Netgear C7000. I like the fewer cords and having it all in one unit so I’m leaning toward that, but I have a fairly large, nearly 3,000 foot two story home. I usually only use the internet in my office downstairs, where we keep the router and modem, but we use our phones upstairs. We are not gamers or heavy internet users so I was hoping the C7000 would be sufficient. I see we can get an extender if we need it which then makes it about the same price as buying the 2 separate units. Do you think I’ll have terrible signal upstairs with the C7000? If I have to get an extender I might just go ahead and buy the 2 separate units. Also, what do you think of the TP-LINK – 802.11ac Wireless Gateway with DOCSIS 3.0 Cable Modem? Last question, my husband is reluctant to buy because he wonders how long these will last. I figure it just needs to last about 3 years to be worth our money to get the $10/mo. off our Comcast bill. Sounds like from your article you have no doubt these will last, even with technology advancements, far beyond 3 years right? It really can depend on your house, other nearby devices, what is between the floors, rooms and much more. For that reason the stronger router is usually better but if you really only plan on phone use upstairs the weaker slower signal may go unnoticed. I myself won’t buy TP-Link based on a few experiences with wireless products of theirs in the past. As they always say; “you get what you pay for”. And no, these will not be outdated. The DOCSIS 3.0 Modems will be in play for a long time. The DOCSIS 3.1 MB8600 is even ready for the future Gigabyte connections. This is great stuff. I have a three story house @ 2600 sqft. I have Comcast Blast 150mps. I have Dish Network, Fire Stick, 2 iPhones, tablet, 2 laptops, 2 Amazon Echos, home automation switches, cameras, etc. I currently am using a Arris modem & router combo SBG6782-AC. On a good day I can only get @ 50mps even though I’m paying for 150mps. I also have my home automation (Wemo) switch drop off often as well. What would you recommend the best option would be? I currently have Comcast 75mbps with a combo Cisco DPC3941T. Just to be clear, the best option would be to return the DPC3941T (to save the $10 a month), and get the Arris SB6183 with the AC3100? Or should I keep the Cisco DPC3941T, and just get the Arris SB6183? In order to save the $10 a month you would have to get rid of their rental Cisco and get the Arris and ASUS. Or the combo modem router. Both will work in your situation. Follow up. I’m very impressed with the info on this blog. Thank you so much. For my three story house, 3 boys, my girl and me using 2 laptops, Xbox and play station, 4 phones, wireless printer, chromecast for school and for entertainment, the combo modem router is working well to solve all our problems. Thank you again! Good info here. Very helpful. I do not think you said what the best wireless gateway was though. That is what I need. I currently have Comcast with my own arris sbg6580. Three story home 4 adults, 4 smart phones, 2 tabs, Chromecast, printer and a laptop. Wirless connection very slow most of time and fall to load. I am ready to purchase. The reason you have such poor speeds is because the sbg6580 is only Wireless N600. It won’t cover a house of your size. The old gateways are combo wireless modem routers. You can’t achieve best speeds with the old ones. To get the best, you need the two separate devices. The cable modem paired with the wireless AC3100 should do for a 3 story house. I have Xifinity high speed internet. I am using xfinity’s DOCSIS 3.0 modem with wireless router. My Internet speed is 200 Mbps. I want to purchase my own modem and replace Xfinity’s. Which modem is recommended? I need download speed and stable internet connection. I connect 8 devices. The cable tech may be able to help you put it in Bridge Mode(needed to disable the built in Comcast wifi router) but not set up your wireless and what not. Unless they are a nice tech? If I was in the field, I would do it but not all techs are created equally. ASUS tech support can help you with it but it is also pretty straight forward in the instructions. I mainly want a better online gaming experience. I’ve been considering a few different options. I have xfinity blast plus 150+. I’m gonna replace the modem/router combo that Comcast supplies. I’m going to replace it with the cable modem. As far as the router goes, I’m stuck between the Asus RT-AC5300, or NETDUMA router. They both have active intuitive settings with emphasis on gaming. Your research and knowledge was very nice to find in my random google search. I love the Netgear cm600 and I splurged on the ASUS 3200 router. Great combo. 20mb down from Steam gaming!